NPR | Write to the Point! 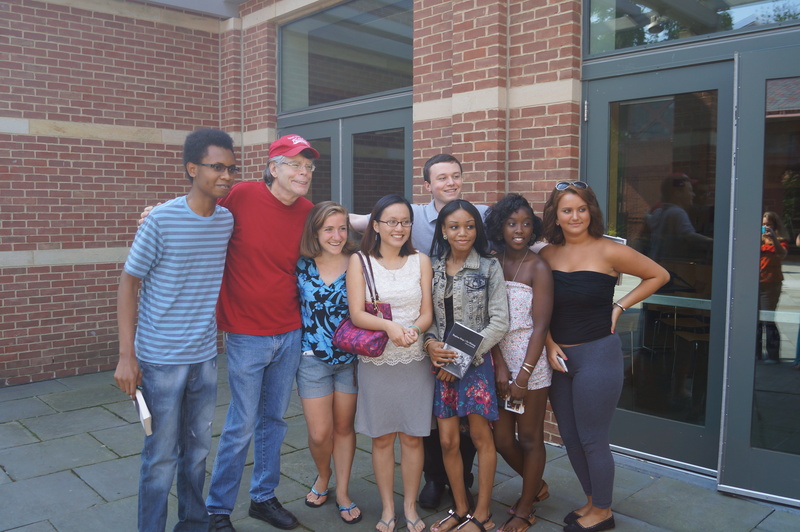 Just as author Stephen King finished his tour of the legendary Mark Twain House & Museum Friday morning, a waiting pack of eager young journalists was ready to pounce. When King paused on the way to his car to say hello, the writing apprentices of Neighborhood Studio’s “Write to the Point!” program each took turns feeling the worn fingers that brought the world over 50 thrilling novels. This certainly wasn’t the first time King has shaken the hands of fans in Hartford. Just last night he joined NPR radio host Colin McEnroe for a dialogue at the Bushnell Theater. King discussed his life and opinions to a packed house that laughed and cheered at every remark and reference the author made. The show, as entertaining as it was, had a very human goal: all the profits went straight to the Mark Twain House & Museum. King was set to arrive at the Twain House for a reception Thursday afternoon. An incredible excitement filled the air, and questions flew in the minds as everyone anticipated his arrival. Josh Hanagarne, a bodybuilding librarian visiting the museum, had the honor of having lunch with King. Everyone was jealous. All the adrenaline pumping through the staff’s thinking caps could only be rivaled by the enormous standing ovations the crowd of thousands gave King at the Bushnell later that night. A photograph produced itself on the Twain House facebook page mid-day; a picture of the King himself signing books in one of the museum offices! He’s here! All the young journalists diligently working on independent projects could do was wait for their own shining moment with the author. It did not come until the day after his stellar performance, though. King was on a tight schedule before he had to return to Maine, but he made sure to first tour the home where Mark Twain lived. When he emerged from the historic home, the writing apprentices greeted him. Dressed casually in a red sweater, King gave the grinning young journalists a moment to remember before he said he had to “jet” and return to his comfortable home in Maine to continue spooking audiences everywhere.